Many coaches are of the opinion that the tennis serve is the hardest shot in tennis to master. Think about it. Your opponent knows precisely where you are going to hit the ball in terms of court area, and they are able to set themselves and be ready to return it. The aspect that makes it even harder is that the serve places all the pressure on the player with the ball in their hand, and giving up a second serve is handing a free point to your opponent. With that in mind, I am going to share with you the best ways to improve your second serve, from the mental side to the mechanics of the shot itself, so you can turn the hardest shot in tennis into a strength of your game. The first step is to put the thoughts of your first serve that missed its target out of your head. For example, when you hit a shot during a fierce rally that is too shallow, you don’t stop and consider it and let it affect your mental processes, you just get on with trying to win the point. The second serve should be no different. I have seen many players giving themselves too much stress on their second serve. Having too much stress causes tension and it leads to the technique being affected. You need to reset, trust your training and put into action the second serve that you have practised. Remember, the second serve isn’t your last attempt to get into the point, it’s your first chance to put your opponent back on their heels with a well-placed kick serve or a wicked top spinning shot that spins out of their reach! These are the basics that are often overlooked by recreational players and even competitive ones. Notice how the best players on the tour have a routine that they go through regardless of whether the serve is the first or second, in the first set or the third; from Nadal’s fidget at the baseline to Sharapova’s stare and low ball bounce. Figure out a routine that works for you and stick to it religiously, it will improve your process and consistency in the shot that needs it most. The next thing to get right is the ball toss. The second serve ball toss needs to be slightly different from the power game of the first serve. To achieve this, the ball needs to be released so that at it’s apex (the highest point) it is slightly to the left of where it would be normally (for right handers, the opposite is true for left handers). The reason for this is simple. To compensate for the less speed that second serves have, players should impart more topspin or kick on their delivery to keep their opponents back on their heels. This means they will not be able to stand closer to the service line and throttle your second serve to a corner of the court that you are not able to cover from the serve area, by giving you more time to complete your service action and set yourself in readiness for the return no matter where it arrives. 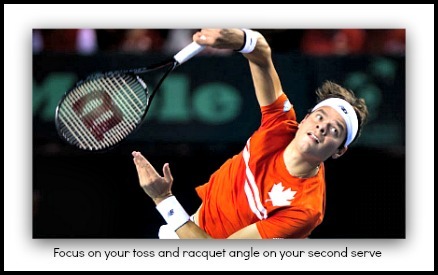 The second focus point needs to be the racquet head speed. The fact is that second serves, even on the professional tour, are slower than first serves. The common myth is that this is because players do not swing their racquet as hard at the ball. This is false. The speed slows down because the focus is more on placement and technique rather than brute power. You should hit the ball just as fast as you do your first serve, and move your arm and whole body through the full range of the shot. The point of difference is the angle, kick and top spin you place on the ball. An easy way to measure the difference is to think of a first serve as hitting the full face of the ball as hard as you can to beat your opponent for pace, and the second as hitting it at an angle to place it exactly where you want to beat them with angle or spin. Which leads to the final thing to keep in mind with a second serve: placement. Many players hit a second serve only hoping it will go in and forget about placing it or hitting it hard. This is a mistake, as good opponents will quickly realise this and take advantage by dictating the point to you. Having a consistent second serve means you can place it to your opponents weaker side, or make them play shots that they are not comfortable with. A serve is the basis of being a great player, but a second serve is just as important as the first, so refining the mental side, the ball toss, the racquet speed and the placement are all ways in which to improve your second serve and your tennis! From "Tennis Second Serve: Powerful Tips To Give You An Edge" To "How To Play Tennis Efficiently And Become A Better Player"